During Christmas and New Years I have been able to (nearly) not think about monetary policy and economics, but I nonetheless came across some comments from Bundesbank chief Jens Weidmann from last week, which made me think about the connection between monetary policy rules and fiscal austerity in the euro zone. I will try address these issues in this post. It is the second part of the quote, which is interesting. Here Weidmann basically spells out his preferred reaction function for the ECB and what he is saying is that he bascially wants an asymmetrical monetary policy rule – when inflation drops below the ECB’s 2% inflation target the ECB should not “arbitrary” cut its key policy rate, but when inflation pressures increase he wants the ECB to act imitiately. It is not given that the ECB actually has such a policy rule, but given the enormous influence of the Bundesbank on ECB policy making it is probably reasonable to assume that that is the case. That in my view would mean that Summer Critique does not apply (fully) to the euro zone and as a result we can think of the euro zone as being at least 50% “keynesian” in the sense that fiscal shocks will not be fully offset by monetary policy. As a result it would be wrong to assume that the budget multiplier is zero in the euro zone – or rather it is not always zero. The budget multiplier is asymmetrical. Let me try to illustrate this within a simple AS/AD framework. First we start out with a symmetrical policy rule – an inflation targeting ECB. Our starting point is a situation where inflation is at 2% – the ECB’s official inflation target – and the ECB will move to offset any shock (positive and negative) to aggregate demand to keep inflation (expectations) at 2%. The graph below illustrates this. If the euro zone economy is hit by a negative demand shock in the form of for example fiscal tightening across the currency union the AD curve inititally shifts to the left (from AD to AD’). This will push inflation below the ECB’s 2% inflation target. As this happens the ECB will automatically move to offset this shock by easing monetary policy. This will shift the AD curve back (from AD’ to AD). With a credible monetary policy rule the markets would probably do most of the lifting. However, the Weidmann rule as formulated above is not symmetrical. In Weidmann’s world a negative shock to aggregate demand – for example fiscal tightening – will not automatically be offset by monetary policy. 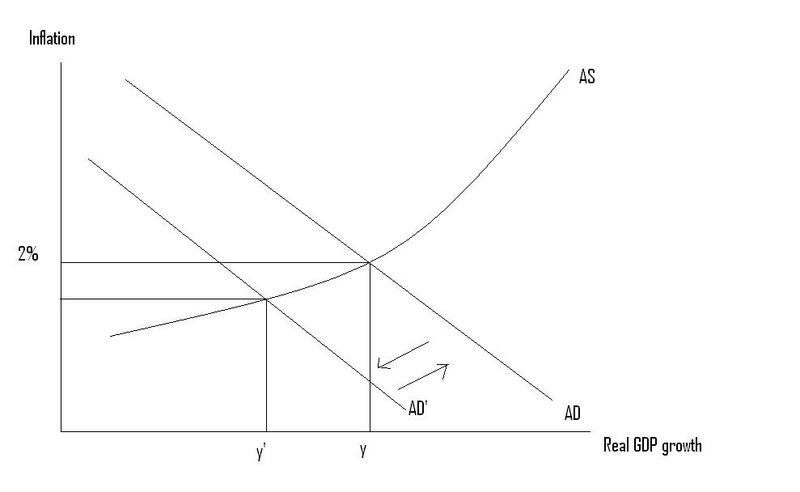 Hence, in the graph above the negative shock aggregate demand (from AD to AD’) will just lead to a drop in real GDP growth and in inflation to below 2%. Given the ECB’s official 2% would imply the ECB should move to offset the negative AD shock, but that is not the case under the Weidmann rule. Hence, under the Weidmann rule a tightening of fiscal policy will lead to drop in aggregate demand. This means that the fiscal multiplier is positive, but only when the fiscal shock is negative. This means that the Sumner Critique does not hold under the Weidman rule. Fiscal consolidation will indeed have a negative impact on aggregate demand (nominal spending). In that sense the keynesians are right – fiscal consolidation in the euro zone has likely had an negative impact on euro zone growth if the ECB consistently has followed a Weidmann rule. Whether that is the case or not is ultimately an empirical question, but I must admit that I increasingly think that that is the case. The austerity drive in the euro zone has likely been deflationary. However, it is important to note that this is only so because of the conduct of monetary policy in the euro area. Had the ECB instead had an fed style Evans rule with a symmetrical policy rule then the Sumner Critique would have applied also for the euro area. The fact that the budget multiplier is positive could be seen as an argument against fiscal austerity in the euro zone. However, interestingly enough it is not an argument for fiscal stimulus. Hence, according to Jens Weidmann the ECB “must be sure to raise rates at the right time should inflation pressure mount”. Said in another way if the AD curve shifts to the right – increasing inflation and real GDP growth then the ECB should offset this with higher interest rates even when inflation is below the ECB’s 2% inflation target. This means that there is full monetary offset if fiscal policy is eased. Therefore the Sumner Critique applies under fiscal easing and the budget multiplier is zero. Concluding, with the Weidmann rule fiscal tightening will be deflationary – inflation will drop as will real GDP growth. But fiscal stimulus will not increase aggregate demand. The result of this is that if we assume the shocks to aggregate demand are equally distributed between positive and negative demand shocks the consequence will be that we over time will see the difference between nominal GDP in the US and the euro become larger and larger exactly because the fed has a symmetrical monetary policy rule (the Evans rule), while the ECB has a asymmetrical monetary policy rule (the Weidmann rule). This is of course exactly what we have seen over the past five years. But don’t blame fiscal austerity – blame the Weidmann rule. PS I should really acknowledge that this is a variation over a theme stressed by Larry Summers and Brad Delong in their paper Fiscal Policy in a Depressed Economy. See my discussion of that paper here. Lars, Weidmann and other Germans insist on a strict anti-inflationary policy but at the same time the price of electricity in Germany is growing at the rate of nearly 12 percent (due to its decisions against nuclear power), partly offsetting the effects of the fall in fuel prices (caused by the previous recession) on total inflation in the eurozone. On the other hand, the growth rate of monetary aggregates is falling down despite the two recent interest rates’ cuts. We need not only monetarists in Europe, but also mass demonstrations in front of Bundesbank and the ECB. Thanks DG, that is of course 100% correct – it should be the Sumner Critique.